Broadberry GPU high-performance servers integrate Intel® Xeon Phi co-processors, working synergistically with Intel® Xeon® processors to enable dramatic performance gains for highly parallel code - up to 1.2 double-precision teraFLOPS per coprocessor. 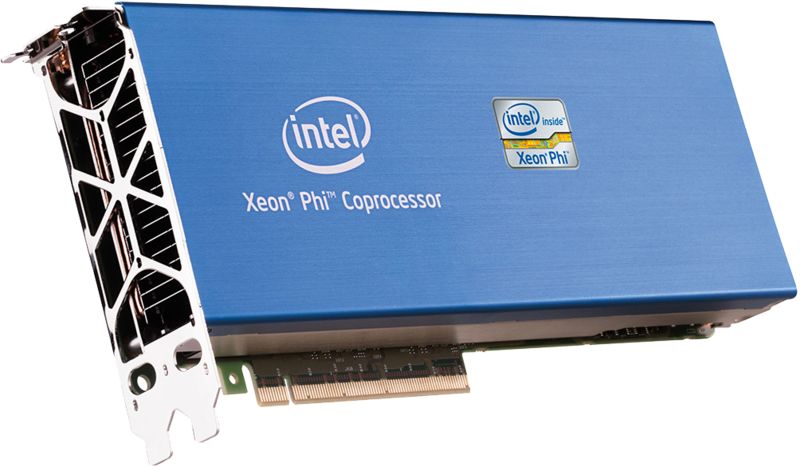 Intel Xeon Phi coprocessors are PCI-Express expansion cards that work along-side the Intel Xeon processor to enable dramatic performance gains for highly parallel code. Broadberry high-performance GPU servers can accomodate up to 8x Intel Xeon Phi cards - delivering up to 1.2 teraFLOPS per coprocessor. Manufactured using Intel's Industry-leading 22nm technology with 3-D Tri-Gate transistors, each coprocessor features more cores, more threads and wider vector execution units than an Intel Xeon processor, compensating for the lower speed of each core to deliver higher aggregate performance for highly parallel workloads.to deliver higher aggregate performance for highly parallel workloads. Configure your Broadberry High-Performance Xeon Phi server with up to 6 of the Intel Xeon Phi coprocessors below. While a majority of applications (80 to 90 percent) will continue to achieve maximum performance on Intel Xeon processors, certain highly parallel applications will benefit dramatically by configuring a Broadberry server with Intel Xeon Phi coprocessors. To take full advantage of Intel Xeon Phi coprocessors, an application must scale well to over 100 software threads and either make extensive use of vectors or efficiently use more local memory bandwidth than is available on an Intel Xeon processor. Delivers over a teraFLOPS (floating-point operations per second) of double-precision peak performance. Additionally, as compared with Intel® Xeon® processor E5 family-based servers, the Intel® Xeon Phi coprocessor delivers up to 2.3 times higher peak FLOPS, up to 3 times more performance per watt, and up to 7 times better performance on certain financial services applications. Applications can support both Intel® Xeon® processors and Intel® Xeon Phi coprocessors which use common languages, models, and familiar and standard development tools, so there's no need to learn new languages or tools. 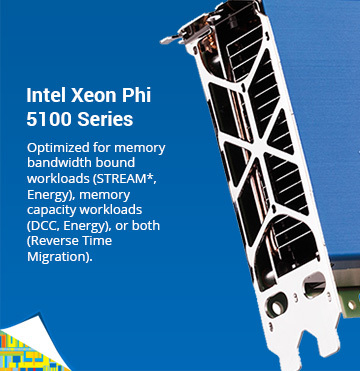 Leverage the compute flexibility of Intel® Xeon Phi coprocessors to either use in Intel® Xeon® processors to accelerate processing of highly parallel code, or create independent, high-performance computing compute nodes with its own IP address and can run applications independently unlike a basic accelerator.